For those of you who weren’t hitting refresh on your twitter feeds last night we heard at approximately 4:58PM that the secret ingredient was…….BACON! We seriously could not have been more excited. 4:59PM: Caught in a torrential downpour… en route to Whole Foods in Tribeca. What were we going to make?? Ideas were spurting from our mouths like bacon fat dancing in a skillet… Tricked out BLT? Bacon-wrapped WHATEVER? Devils on horseback? 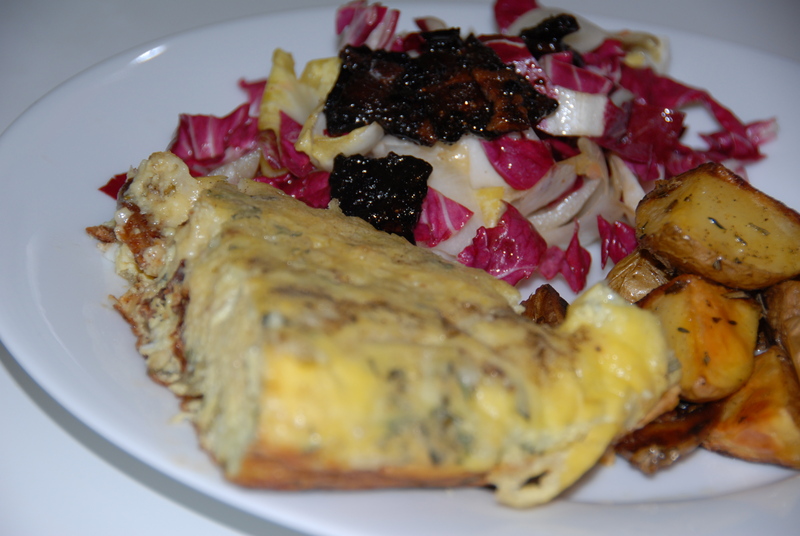 Tartiflette? Is there a bacon soup?? (hot ham water anyone?) The list went on… But then, organically, like magic, the perfect menu came to us. 6:00PM: Battle stations. 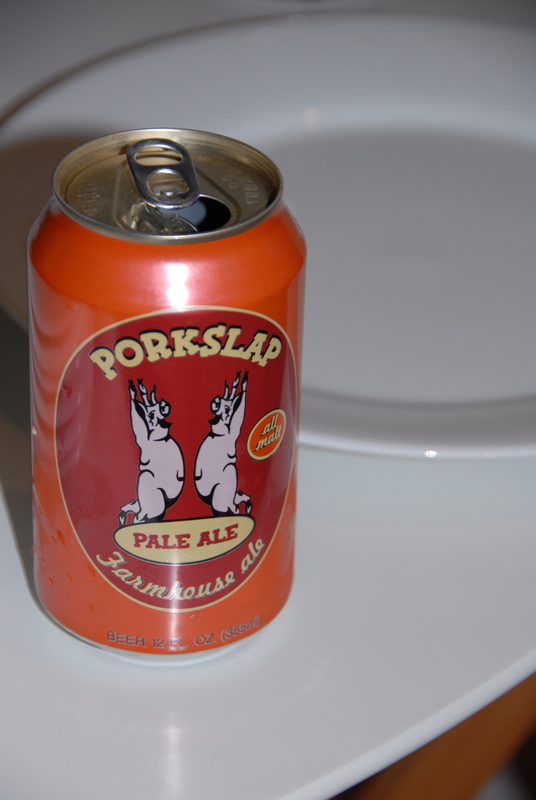 Porkslaps in hand. We got right to work, slab bacon cut into “bite” sized pieces, covered in brown sugar and black pepper, strip bacon spiraled around chop sticks, and cream and maple syrup coming to a gradual boil on the stove. 6:18PM: The scent of bacon hanging heavy in the air… Yukon golds washed, quartered and doused with olive oil, rosemary, and thyme. Maple cream combined with eggs and sugar and cooked until thick. 6:42PM: Everything is coming together, radicchio and endive lettuces washed, spun, and dressed, fresh herbs chopped, gruyere grated. Obviously everyone was too busy stuffing their faces to comment on how delicious everything turned out to be (seriously, it is DIFFICULT to make something un-delicious involving bacon). 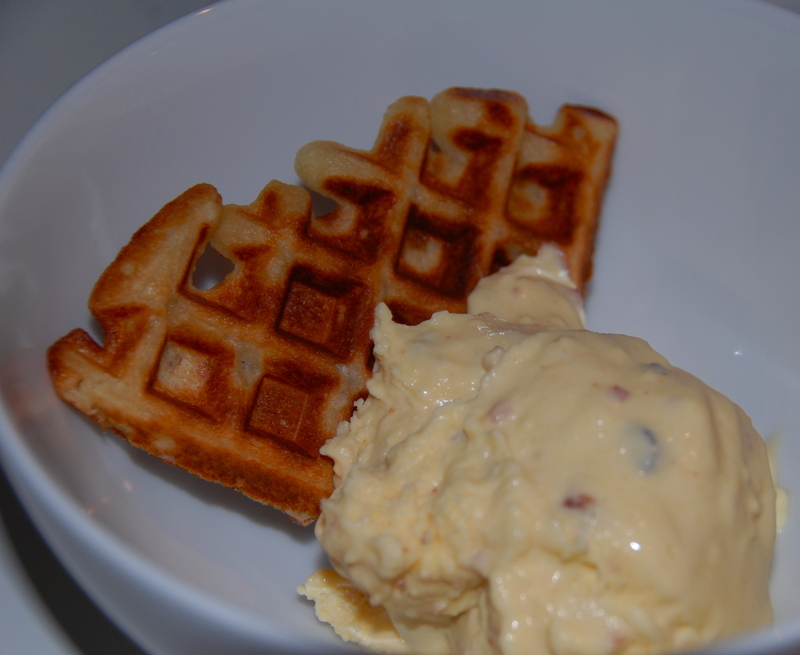 Home churned maple bacon ice cream, served on a warm sourdough waffle quarter (thanks to Hil who already had the batter in the fridge). Probably the best thing we’ve ever tasted. Honestly, thank goodness there were seven of us to consume the quart in one sitting, you don’t want something like that hanging out in your freezer. Have you ever heard of a bacover? because it happens. This morning we awoke a little groggy and quite puffy from all the bacon festivities but we both agree – it was worth it. A HUGE thank-you to our guest tweeters and friends who provided us with mouths to feed and dazzling conversation. Baconfest 2011 was a complete success. 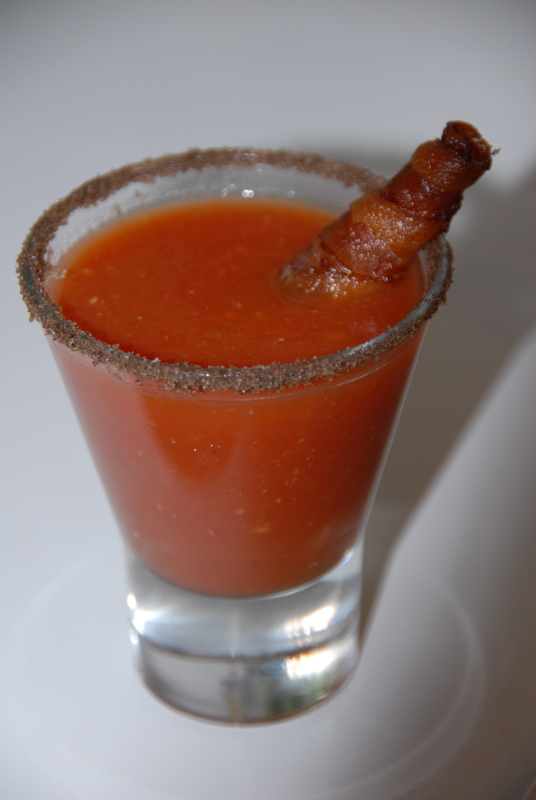 If you’d like to know more about the recipes we created for Baconfest 2011 feel free to email us at ataleof2kitchens@gmail.com. Also, be sure to follow us on twitter @ataleof2kitch and like us on Facebook. This entry was posted in Bacon and tagged bacon, candied bacon, endive, frittata, gruyere, maple bacon ice cream, maple syrup, Porkslap, radicchio, rosemary, thyme, waffle. Bookmark the permalink. Sounds delicious!!! The bloody Mary especially sounded like it was scrumptious. Great creativity with an everyday ingredient.